The winner is... not so much a single type of oil, despite the common believe that it's olive oil. Research tells us the healthiest oil is actually a number of choices. Olive oil? Sunflower? Avocado? Peanut? What's the healthiest oil? The answer may lie in variety, based on such factors as personal taste and budget. Liquid vegetables oils—for example, olive oil and soybean oil—are celebrated as healthy unsaturated fats. Unsaturated fatty acids, when substituted for saturated fats, support general heart health. 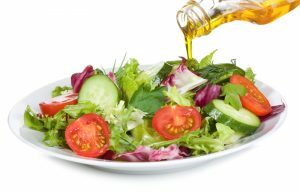 But for cooking, baking, or dressing salads, what is the healthiest oil? Many people would probably answer “olive oil.” This cornerstone of the Mediterranean eating pattern has been showered with positive press in recent years. However, most liquid plant oils, with the exception of certain tropical oils like coconut and palm oils, have more in common than not—if you take a wide-angle view. Beyond the hype about the health benefits of particular dietary fats, there isn’t much solid science to justify stocking up your pantry with any particular option. Instead, let your taste preferences and food budget be your guide and try to use a variety of oils. Walnuts are a worthy source of alpha-linolenic acid (ALA), an important omega-3 fatty acid. 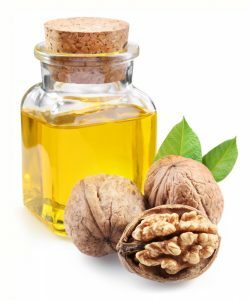 As such, walnut oil has become a popular type of oil for flavoring, as the USDA notes. The spectrum of liquid vegetable oils includes avocado, canola, corn, olive, peanut, pumpkin seed, safflower, sesame, soybean, sunflower, and walnut oil. Each contains lots of monounsaturated fatty acids and polyunsaturated fatty acids, and each remains a liquid at room temperature. 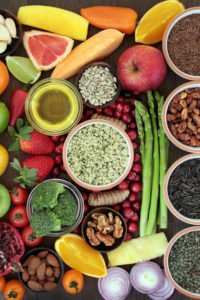 According to the 2015–2020 Dietary Guidelines for Americans, oils contribute to a healthy eating pattern because they are a rich source of essential omega-3 and omega-6 fatty acids. They’re called “essential” because your body can’t make them on its own, yet they’re necessary for good nutrition. Oils are also an important source of vitamin E, an essential vitamin that acts as an antioxidant. This protective chemical neutralizes the free radicals formed during normal cell activity. Common causes of exposure to free radicals in the environment include cigarette smoke, air pollution, and ultraviolet light from the sun. Polyunsaturated fats are most abundant in corn, cottonseed, flax, pumpkin, pine nut, sesame, soybean, sunflower, and walnut oils. Monounsaturated fats exist in the highest percentages in avocado, canola, olive, peanut, sunflower, and safflower oils. Coconut Oil: Cholesterol Villain or Health Food Darling? Randomized controlled trials to date show that reducing your intake of saturated fats and replacing them with polyunsaturated fats lowers the chance of cardiovascular disease by about 30 percent—roughly the same effect as taking a cholesterol-lowering statin drug. Long-term observational studies have shown that people who eat less saturated fats and more mono- and polyunsaturated fats are less likely to have cardiovascular disease and have a lower risk of death from heart diseases and other causes. Replacing saturated fats with unsaturated fats lowers “bad” LDL cholesterol, a cause of coronary artery disease (narrowed arteries to the heart). Replacement with monounsaturated fats accounts for 15 percent of the lower risk, while substitution with polyunsaturated fats brings 25 percent less risk. Replace some of your saturated fats from animal foods with unsaturated fats from plant oils; that practice, per research, appears to promote health. Remember that monounsaturated fats are still associated with good health, so olive oil consumption—relative to saturated fat intake—is beneficial. Try to consume a variety of oils based on your taste preferences and food budget. For example, go ahead and try some fancy extra-virgin olive or pumpkin seed oil for drizzling on salads, but corn or canola are still healthy options for general use. Regarding the latter point, eating a variety of oils broadens the portfolio of fatty acids in your diet along with the benefits that different ones may offer. In combination with fish and nut consumption, you’ll get what you need without having to micromanage your fatty acid intake. Tropical plant oils are the exception to the rule. Palm kernel and coconut oil are high in saturated fat, so replacing animal fats with those options doesn’t make much sense. All other things being equal, the bottom line is that it’s best to favor oils that primarily contain monounsaturated and polyunsaturated fatty acids. Oils are relatively calorie-dense. 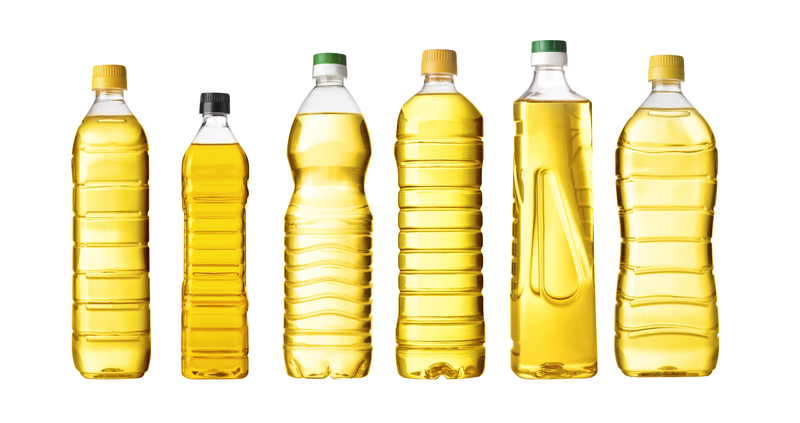 Vegetable oils contain about 120 calories and 14 grams of fat per tablespoon. But push the pause button for a moment about fats and calories—a much-misunderstood concept in healthy eating. Before nutrition guidelines shifted focus from total fats to types of fats, a lot of people became fat-phobic. Health writers often still warn you not to overdo it on the oils, because they are “loaded” with calories. If you’re overweight and counting calories, vegetable oil intake may be something to be mindful about. But keep in mind we don’t eat our oils by the tablespoon—we eat them as part of meals and overall dietary patterns. Although oils add calories to meals, they are also more satiating and therefore could help reduce cravings between meals. In combination with dark, leafy greens in salads, oils help the body to absorb fat-soluble nutrients like carotenoids—the pigments that make fruits and vegetables yellow, orange, or red. Finally, fats add flavor and pleasant “mouth feel” to healthy foods. Consuming nutritious foods that you like—as opposed to ones you think you are supposed to eat for your own good—can help sustain an overall healthy eating pattern. I love flax seed oil, because it does not solidify in the refrigerator. Why do I never hear about flaxseed oil? what about grape seed oil ?? Avocado is wonderful for making homemade mao or salad dressings. 225 degrees for high heat frying. You still did not answer the question as to which is the best oil to use. All you do is give general information.and a bunch of choices. Just once, give a straight answer and give the top one and then the second and third. Thank you. Whenever I consume soybean products I get a strange feeling in my breast, so I stay away from soybean products. For Polyunsaturated fats it is healthy and safe to consume sesame, sunflower and walnut oils and eat ground flax seeds. For Mono fats consume only the California Everyday Extra-Virgin Olive Oil (this way you avoid the Italian Mafia Olive Oil frauds. .
What about grape seed oil, particularly for sautéing meats or vegetables? Interesting piece. Love to hear your thoughts on Oleumm8 cooking oil. Healthy Consumer….. You are right: The article does not state one “best” oil. The sub-headline (in italics, under the main headline) says that. The reason: To answer that question would require a head-to-head randomized clinical trial, and such a trial is not practical or economical. I doubt that food oil manufacturers are prepared to spend $100 million on that!